Wow, readers. What a crazy weekend. Did you watch the Super Bowl yesterday?? I was sad I couldn’t watch it because of the time difference, but I bet the halftime show was great! So this past weekend was the first weekend that I left Ireland to go to a different country – Edinburgh, Scotland, to be exact. It was a learning experience, what with planning travel and sleeping arrangements by myself and actually following through with it, but Edinburgh turned out to be an absolutely amazing city. Let me walk you through some of my adventures! The first thing I noticed was that Dublin and Edinburgh were different kinds of old. Where Dublin has a lot of old history mixed with very recent history, Edinburgh has tons of Gothic history, as shown in the architecture of their buildings. Because of this, the city feels like something straight out of fairytale with towering Gothic cathedrals right in front of you, and beautiful hills and mountains in the background. This is the largest monument erected for a writer in the world! It’s for the writer Sir Walter Scott (a Scotsman) and has amazing Gothic architecture. You could climb all the way to the top of Scott’s Monument in a spiral staircase and this was just part of the way up! Many of the buildings were made with stone that was absorbent. Scotland used to be a very smoky city, and so the stones absorbed the smoke, giving them a darker color and a more Gothic feel. The view from the top of Scott’s Monument! This was a Cathedral in the center of town – beautiful! Edinburgh is also a very small city, with the more modern part of the city to the north, and the old historic part of town being to the south. Our hostel was on the south side, and so Meg and I spent most of our time on the south side in a vicinity called the Royal Mile. This street has the famous Edinburgh Castle on the western most end of the street, and the Palace of Holyrood (where the Queen of England stays during her trips to Scotland!) on the East side. We took walking tours and explored the city for hours resulting in us discovering some of the best lunches and sweet treats the city had to offer! 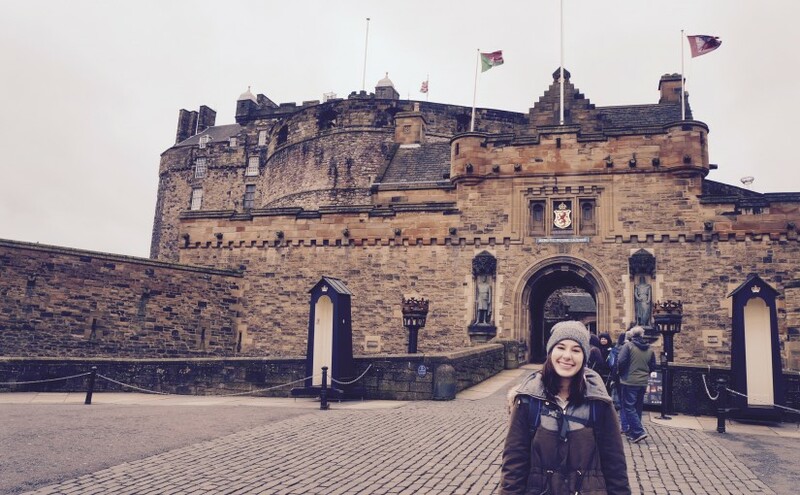 This is me in front of the crazy cool Edinburgh Castle – it was fantastic. Edinburgh Castle had some cool architecture! The entrance to Holyrood Palace! Inside Holyrood Palace, this courtyard was called the Quadrangle. Interesting. Another thing about Edinburgh that I found very interesting is that it is where J.K. Rowling first wrote the Harry Potter books! Because of this, many of the places/people found in the books are inspired from the places/people of the city. Upon finding this out, Meg and I knew that we had to do a walking tour highlighting all of the little Harry Potter-isms the city had to offer. We saw the cafe where J.K. Rowling first wrote Harry Potter, a cemetery where she got a ton of her inspiration for the books, and got to hear about the history of the city as well. This was the bathroom wall in The Elephant House cafe – it’s become a thank you wall to J.K. Rowling and a Dumbledoor’s Army list. So cool! This is the cafe where J.K. Rowling wrote many of the Harry Potter books – table 12 if we’re going to be technical. They also have the best shortbread I’ve ever eaten. J.K. Rowling walked through this cemetery often and got her inspiration for many names in the book from here. This gravestone bears the name Tom Riddle – sound familiar? This gravestone was the inspiration for the character Professor McGonagall in the Harry Potter books! It was a fantastic two days, and this was just a taste of what we experienced. If you have any questions or comments about my travels, please ask! I love talking about the different things I’ve done/will do!